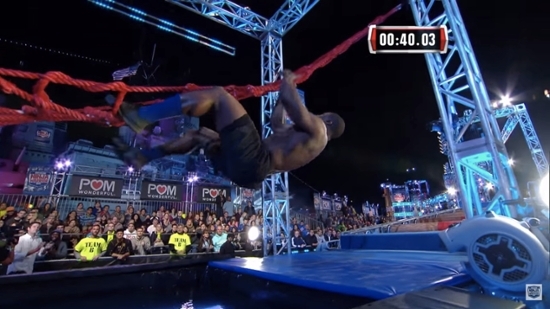 Deon Graham, '09 civil engineering, uses brain and brawn on "American Ninja Warrior"
Deon Graham, '09 civil engineering, is currently competing in season seven's "American Ninja Warrior." Featured in the July 6 episode, Graham proved he had the skill and physical prowess necessary to advance on to the city finals, airing in August. Read to learn how Graham, a nuclear trained warfare officer for the Navy, became involved with the show, and how earning a civil engineering degree from Auburn was one of the best decisions he ever made. Also, be sure to check out videos of Graham's performance on the July 6 episode and his season seven audition below this interview. 1. How did you get selected to compete and how did you prepare? The audition process consisted of a 12-page online application and a three-minute video displaying my athleticism, training regimen and background information on myself. “American Ninja Warrior” exploded in popularity, and 50,000 people applied to be on it this year, compared to 10,000 last year. This year, the show wanted to do a special active/retired military-themed episode and I was selected because of my job as a nuclear trained surface warfare officer for the Navy. To prepare and condition, I did a lot of upper body training, focusing more on my body weight routine than traditional weightlifting. This consisted of a lot of pull-ups, push-ups and grip strength. I also utilized indoor rock-climbing walls and spent time outside improving my endurance. I did not have a trainer, but did research online on how athletes and other people trained, and I frequented my gym, OneLife Fitness, a lot. OneLife Fitness was great to me because they let me film my audition video in the gym. Everyone there was extremely excited for me when I was selected for the show, and it gave them publicity since they were given some national television time when my episode aired. 2. How did you feel when it was time to film you going through the course the first time? It was nerve wracking. The show films overnight and we were in Long Beach, California, so we didn’t even begin until sunset. I was one of 110 people filmed and was right in the middle. That was a good thing since it gave me a chance to observe other people going through the course before me and helped me determine different tactics to use. When it was my turn, my first thoughts were just don’t fall on the first obstacle. However, once I got going it was just a rush with the crowd cheering and my adrenaline pumping. It honestly felt like how a professional athlete experiences a game, with lots of cheering and support. When I did hit the water and did not complete the course, I was disappointed. But, at same time, I came all the way out to Long Beach, and didn’t give up. It felt like I truly accomplished something great by going out there and giving it my all, and it was an opportunity not a lot of people get to experience. I am a nuclear trained surface warfare officer for the Navy, currently residing in Norfolk, Virginia. I oversee the propulsion systems and personnel on our nuclear-powered aircraft carriers. I also supervise the maintenance and operations of nuclear aircraft engineering space and keep the reactors under my control. Graham on graduation day in 2009. 4. How did you choose Auburn and decide to major in civil engineering? I enlisted in the Navy right after high school and served for two years, before I was selected for the commissioning program. The program paid for my college education as long as I was serving as active duty through a school’s ROTC program. However, because of the specialized training I required, the Navy only offered a certain number of schools I could attend, and Auburn was on that list. I originally wanted to attend North Carolina State since that was closer to home, but that did not work out and Auburn ended up being my number two choice. However, everything happens for a reason and as soon as I arrived at Auburn, I knew I had made the right decision and fell in love with the people and campus. Another requirement of the commissioning program was I had to attend classes year-round and had to graduate within three years. It was a major challenge to major in civil engineering, and complete it in only three years. However, I still decided to pursue it because math was always one of my strongest subjects, and I thought earning an Auburn Engineering degree would serve me well in any capacity, whether I stayed in the Navy or pursued other options. I was most intrigued with civil engineering because I could study structural analysis, and civil is such a tangible field where you can see and touch everything. 5. 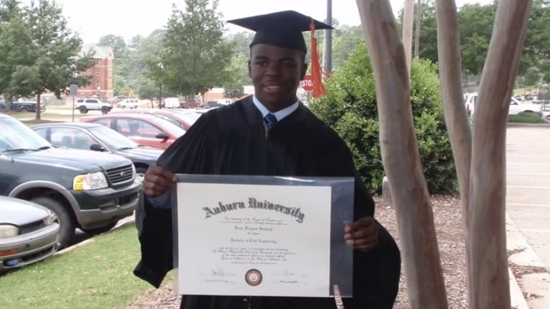 How has your Auburn Engineering degree helped you in your profession? Just the basic classes of engineering provided me a solid foundation for my profession. I learned how to solve problems which is a large part of what I do now in my job. When I’m in a ship with a reactor, I always take a methodical approach to solve challenges and my Auburn Engineering degree laid that groundwork for me. 6. What piece of engineering advice would you share with our students? There are 100 things I could say to a student that I wish someone had said to me before entering engineering at Auburn. The one piece of advice I’ll share is to always stay focused on the end result. You’re getting the best education possible and this is not an opportunity afforded to everyone. Sometimes things will seem overwhelming and you may think you can’t handle it, but if you maintain your focus and see the long-term benefits, then everything will fall into place. 7. What are your next steps? Within my career I’m coming up on a major milestone with the Navy, where I have to make a decision of either committing for 10 more years or evaluating what else is out there for me. Right now, thanks to the show and social media, I’ve received a lot of interest and had a few interviews for possible consulting positions with different companies. It’s amazing what social media and a little bit of time on TV will do for you. I have a lot to think about and going into the business side of things does appeal to me because I have to think about my future and how to continue to market myself. Right now the business world is interested in me, and I have to ask myself if they will still be just as interested 10 year down the road. It’s a lot to think about, but it’s a very exciting time and I’m just thankful for this opportunity. 8. What is your favorite Auburn memory? That would be the 2006 Auburn vs. University of Florida football game. We played them at home and beat them, and they went on to win the national championship. That game was so intense, and the crowd was so loud that I think that’s what made Florida miss that field goal and we went on to win. It was such an awesome game and was the first moment I fell in love with Auburn.